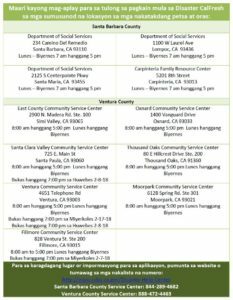 If you’ve been affected by recent disasters in Santa Barbara County – if you lost work, income, or experienced other impacts – you may be eligible for additional, temporary emergency food support through CalFresh/SNAP. 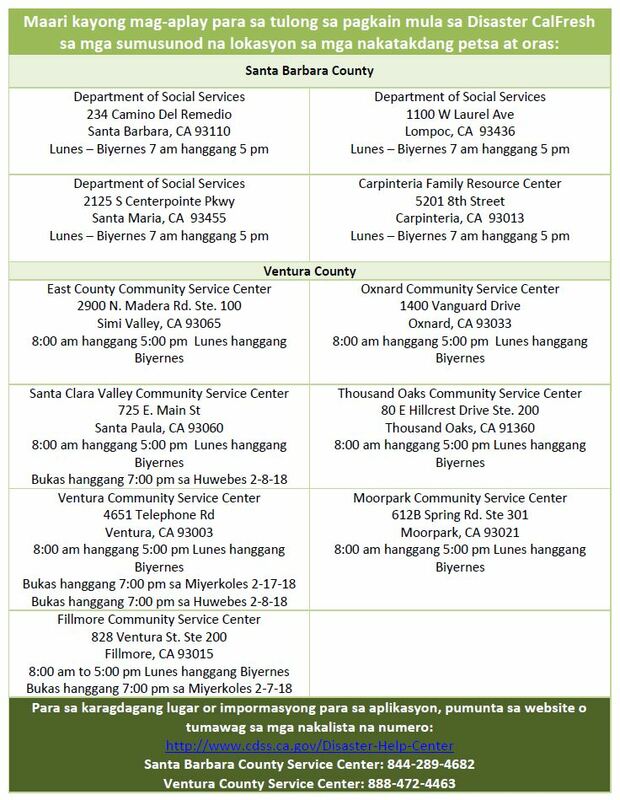 EVEN IF YOU USUALLY DO NOT QUALIFY for CalFresh/SNAP, YOU MAY BE ELIGIBLE DURING THIS 30-DAY EMERGENCY PROGRAM. INCLUSO SI USTED NO CUALIFICA GENERALMENTE para CalFresh / SNAP, PUEDE SER ELEGIBLE DURANTE ESTE PROGRAMA DE EMERGENCIA DE 30 DÍAS. You must visit one of these offices to apply. Debe visitar una de estas oficinas para postularse. CalFresh is the name for the federal Food Stamps Program in California. In most other states, this program administered by the U.S. Department of Agriculture is known as the Supplemental Nutrition Assistance Program (SNAP). Your family may qualify for CalFresh. CalFresh is a nutrition program that helps you feed your family healthy meals every day. Your friends at the Foodbank are always glad to help you with your CalFresh application. With our help, you can have a better chance of being approved. Are You Struggling to Put Food on the Table? The CalFresh program may be able to help you get the nutritious food you need. In just 20 minutes, our bilingual staff can help you fill out the application on the phone. We also submit the application to the CalFresh office on your behalf. It’s that easy. You can also fill out the form below and we will call you. And if you have any questions, just call us. We’re here to help! You will be contacted within 48 hours by a Calfresh representative from the Foodbank. If you are a Foodbank Nonprofit Partner or other community organization and would like more information about our CalFresh Outreach program, including presentations and training, please call the Foodbank’s South County branch at (805) 967-5741 or the North County branch at (805) 937-3422. CalFresh is a supplemental food program to help individuals and families get the food they need to stay healthy. The CalFresh benefit is provided in an EBT debit card that looks like any other debit card. You can use it to purchase groceries and fresh produce at participating grocery stores and farmers’ markets just like you would any other debit card. The CalFresh debit card also makes it easy to make healthy choices because you can shop for the nutritious foods you and your family prefer. CalFresh puts food on your table and dollars into the local economy. Every CalFresh dollar you spend generates $1.79 for the local economy. Everyone benefits when people are able to buy healthy foods from their local grocery store or farmers’ market. 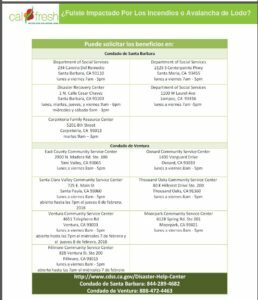 Who is Eligible for CalFresh? CalFresh is available to individuals and families with low incomes. Citizens and most legal residents are eligible. Undocumented immigrants are usually not eligible, but can apply for their children who are legal residents or U.S. citizens. Even if you have applied for CalFresh before, you should try again. New legislation was passed to increase access and you may be eligible now even though you weren’t before.